A conch ( "konk" or ) is one of a number of different species of medium-sized to large saltwater snails or their shells.The true conchs are marine gastropod molluscs in the family Strombidae, and the genus Strombus and other closely related genera. About 74 species of the Strombidae family are living, and a much larger number of species exist only in the fossil record. Of the living species, most are in the Indian and Pacific Oceans . Six species live in the greater Caribbean region, including the Queen Conch, and the West Indian Fighting Conch, Strombus pugilis. Like almost all shelled gastropods, conches have spirally constructed shells. Again, as is normally the case in many gastropods, this spiral shell growth is usually right-handed, but on very rare occasions it can be left-handed. True conches have long eye stalks, with colorful ring-marked eyes. The shell has a long and narrow aperture, and a short siphonal canal, with another indentation near the anterior end called a stromboid notch. This notch is where one of the two eye stalks protrudes from the shell.The true conch has a foot ending in a pointed, sickle-shaped, operculum which can be dug into the substrate as part of an unusual "leaping" locomotion. True conches grow a flared lip on their shells only upon reaching sexual maturity. Animals which are harvested by fishermen before they reach this stage are juveniles, and have not had a chance to reproduce. In the island of Guam, the people eat it "findened", meaning soaked in soy sauce with vinegar or lemon with hot peppers. In El Salvador, live conch is served in a cocktail of onion, tomato, cilantro, and lemon juice. Lemon juice is squeezed onto the cocktail, causing the conch to squirm, and then the whole thing is slurped down whole, as in the manner of oysters. Conch shells can be used as wind instruments, see Conch . Many gastropods (snails and sea snails, of which the conch is the latter) produce pearls, and those of the Queen Conch, Strombus gigas, have been collectors' items since Victorian times. Conch pearls come in a range of hues, including white, brown and orange and many intermediate shades, but pink is the colour most associated with the conch pearl. Conch pearls are sometimes referred to simply as 'pink pearls'. In some gemmological texts, non-nacreous gastropod pearls used to be referred to as 'calcareous concretions' because they were 'porcellaneous' (i.e. shiny and ceramic-like) in appearance rather than 'nacreous' (i.e. with a pearly lustre sometimes known as 'orient'). The GIA and CIBJO now simply use the term 'pearl' (or, where appropriate, the more descriptive term 'non-nacreous pearl') when referring to such items and, under Federal Trade Commission rules, various mollusc pearls may be referred to as 'pearls' without qualification.Although non-nacreous, the surface of fine Conch pearls has a unique and attractive appearance of its own. The microstructure of conch pearls comprises partly-aligned bundles of microcrystalline fibres which create a shimmering, slightly iridescent effect known as 'flame structure'. The effect is a form of chatoyancy, caused by the interaction of light rays with the microcrystals in the pearl's surface, and it somewhat resembles Moiré silk. Conch shells are sometimes used as decoration, as decorative planters, and in cameo making. In classic Mayan art, conchs are shown being utilized in many ways including as paint and ink holders for elite scribes, as bugles or trumpets, and as hand weapons (held by combatants by inserting their hands in the aperture). Some American Aboriginals used cylindrical conch columella beads as part of breastplates and other personal adornment. In some Caribbean and African American cemeteries, conch shells are placed on graves. In some Caribbean countries, cleaned Queen Conch (Strombus gigas) shells, or polished fragments, are sold, mainly to tourists, as souvenirs or in jewelry. Responding to a 2003 recommendation from CITES, some countries in the Caribbean have banned the export of Queen Conch shells. CITES has also asked all countries to ban import of Queen Conch shells from countries that are not complying with CITES recommendations for managing the fishery. Queen Conch fisheries have also been closed in several countries. Conch shells or fragments taken home by tourists from non-complying countries may be confiscated on return to the tourist's home country while clearing customs. In the UK conch shells are the ninth most seized import. Conch shells are occasionally used as a building material, either in place of bricks, or as bulk for landfill. In Grenada fishermen use Conch shells to announce to the community that fish is available for sale. It is also used at Carnival times in the popular Jouvert Jump where Diab Diab (Jab Jab) mas blow conch shells as part of the festivities. In the Bahamas, broken or up-turned conch shells are imbedded into the tops of outdoor walls in an effort to maintain home security; the broken or up-turned shells are sharp enough to cut any intruder who attempts to jump or crawl over the wall. A Shankha shell (the shell of a Turbinella pyrum, a species in the gastrpod family Turbinellidae) is often referred to in the West as a conch shell, or a chank shell. This shell is used as an important ritual object in Hinduism. The shell is used as a ceremonial trumpet, as part of religious practices, for example [[Puja (Hinduism)|puja]]. 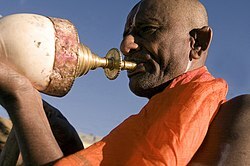 The chank trumpet is sounded during worship at specific points, accompanied by ceremonial bells and singing. In the story of Dhruva the divine conch plays a special part. The warriors of ancient India blew conch shells to announce battle, as is described in the beginning of the war of Kurukshetra, in the Mahabharata, the famous Hindu epic. The god of Preservation, Vishnu, is said to hold a special conch, Panchajanya, that represents life, as it has come out of life-giving waters. As it is an auspicious instrument, it is often played in a Lakshmi puja in temple or at home. Buddhism has also incorporated the conch shell, as one of the Eight Auspicious Symbols. The Moche people of ancient Peru worshiped the sea and often depicted conch shells in their art. William Golding's Lord of the Flies features frequent references to "the Conch". In the book the conch is used as a trumpet to call everyone together and held by whoever is speaking at meetings, symbolically representing democracy and order. When a boulder released by Roger, Jack's lieutenant, smashes the conch, it is a sign that civilized order has fully collapsed since Jack's eventual increasing influence. The famous Old English riddle Ic wæs be Sonde describes a conch: "I was by sound, near seawall, at ocean-stream; I dwelt alone in my first resting place. ... Little did I know that I, ere or since, ever should speak mouthless over mead-benches." Another meaning given to this riddle ‘Ic wæs be Sonde’ is that the sound of the conch corresponds to spiritualised sound as heard in higher realms. In the Hindu tradition, the conch shell is used in ceremony as the sound it makes is said to correspond with higher frequency universal sounds associated with music of the spheres. In popular folklore, it is believed that if one holds an open conch shell (or any other large marine snail shell) to the ear, the ocean can be heard. This phenomenon is caused by the resonant cavity of the shell producing a form of pink noise from the surrounding background ambiance. The Last Miles of the Way: African Homegoing Traditions, 1890-Present, edited by Elaine Nichols.